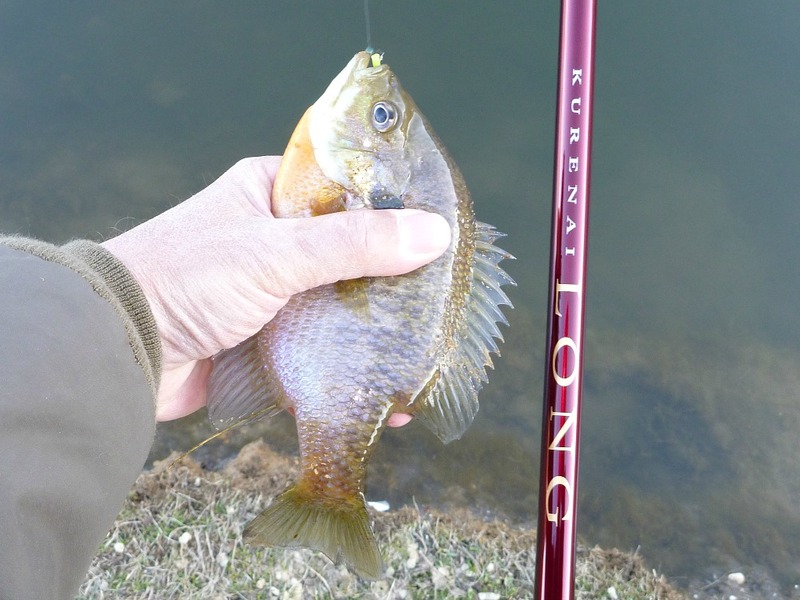 The Suntech Kurenai Long is a surprisingly light, surprisingly strong keiryu rod that also works quite nicely as a big water / big fish tenkara rod. I think by now everyone knows I really like the Suntech Kurenai rods. I think by now everyone knows I really like long rods. Put the two together and you get the Suntech Kurenai Long, which I really, really like. I need to say right up front that the Kurenai Long does not have the extremely soft tip sections that the Kurenai HM30R and other HM rods have. The Suntech Kurenai Long is clearly designed for bigger water and bigger fish. It is still a remarkably responsive and sensitive rod, but it is beefier than the Kurenai HM series of rods. The Suntech Kurenai Long rods come in three different lengths - 6 meters, 7 meters and 8 meters. I've had all of them at one time or another. The first one I got in was the 8 meter rod. An angler in Canada ordered it for his father, who had fished very long rods in Europe. It was the first 8m rod I'd ever gotten a chance to handle (and swing around in a nearby park) before mailing it out. I was surprised by the inertia in an 8m rod. I collapsed one section to get a sense for the 7m rod, and it still seemed a bit long. I collapsed another section and decided the 6m rod might be pretty nice. That was the dead of winter, but the following spring I ordered a 6m rod for myself. The first time I got a chance to use it I decided it wasn't just pretty nice, it was very nice. I've written a bit in the past about how light and smooth casting the Nissin Air Stage Honryu rods are. One of the contributing factors is certainly their long collapsed length. Longer sections means fewer joints. 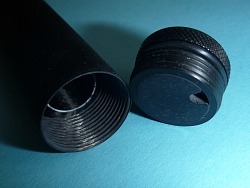 Each joint is a hard spot (not only do the tubes overlap, they are reinforced at the section ends). Also, shorter tubes just do not bend as easily as longer ones. Plus, the overlaps and reinforcements add to the weight. Longer sections give you a smoother bend profile and lighter weight. The Kurenai Long 61 weighs just 3.7 ounces without the KTC-16 tip cap. That's very light for a 20' rod! The Aoi ZPRO 63 is that light but it is rated for 6X tippet. The Kurenai Long 61 is rated for 4X tippet! That's enough to handle nearly any fish you are going to catch. ERiK Ostrander of the Tenkara Guides in Salt Lake City catches carp with 4X tippet. I wouldn't recommend using a Kurenai Long for carp but it should handle good sized trout without issue. Do not get the impression that the rod is so stiff it is only fun with large fish, though. It makes a great rod for modest trout (upper right) and for good sized bluegills (and that is definitely NOT the case with the beefy rod ERiK uses for carp). For that matter, you could also use it to fish midges in tailwaters. Although Suntech recommends 4X as the maximum tippet, the rod will protect tippets as light as 8X. There aren't many places where you have to go lighter than 8X to catch fish! The design feature that allows the rod to be so light and so strong (and so sensitive) is also it's only real disadvantage. The Suntech Kurenai Long is 45.5" when collapsed. It's not a rod for backpacking. It's also not a rod for when you take more than one rod with you on the stream. While a Zimmerbuilt Sling or the BW Sports backpack can hold the Kurenai Long while you fish a different rod, it would be hard to walk down a streamside trail with it on your back if you have to duck to go under low branches or vines. However, if you drive to the stream and will need only one rod until you can get back to your car, a long collapsed length yields only advantages. I have not fished with the 8m Kurenai Long, but after fishing with a 7.2m Suntech Keiryu Sawanobori in Colorado, a 7m Daiwa EP Zero at the Wisconsin Midwest Tenkara Fest, and the 6.8m Suntech Aoi ZPRO 68 in Massachusetts, and the 7m Kurenai Long very briefly, let me say that a 7m rod is very definitely not too long if you don't have overhead tree branches to worry about. Most keiryu rod models (from Suntech as well as other companies) come in 7m lengths, and the long rods are more popular in Japan than the shorter ones. That said, the Kurenai Long 61 is a lot more pleasant to fish with. It has a sense of being impossibly light, which is not shared by the 71 or 81. The Kurenai Long grip is long! It is very nearly 16" long and coated with a very effective nonskid finish. People who have asked me why most two handed rods don't have a nonskid finish where you put your upper hand will like this grip. It isn't a terribly wide grip, but for a light rod that you hold with both hands it doesn't have to be. The grip screw cap is plastic. It has a rubber O ring so that it can be tightened snugly and has knurling to allow you to tighten or remove the cap easily. There is a ventilation hole - which is actually designed so that you can collapse the rod more easily, not to dry out the rod between uses. Please disassemble the rod between uses so that it can dry thoroughly. The Suntech Kurenai Long has a unique feature. There are alternating white and black bands at the rod tip. I have commented in a couple trip reports and in my presentations at the Midwest Tenkara Fest and the last Tenkara Jam that watching the rod tip can be an effective strike indicator when you can't see the water you are fishing - either because you are standing back from a steep bank or because you are fishing on the other side of a big rock. I have caught fish by watching the rod tip when looking at the line would have been looking directly into glare on the water, and also when fishing very deep in a very slow pool. The white and black bands will make watching the rod tip easier with this rod than with any other. It may not be a feature you'll use often, but once you get used to it, you'll use it more than you think. Length and weight: 6.1 and 7.1 from my own measurements. 8.1 from Suntech stats. All in all, the Suntech Kurenai Long 61 is one of my favorite rods. If you are looking for a very nice, very light long rod (that can handle 4X tippets), these are rods to seriously consider. Suntech Kurenai Long 71 and 81 available by special order. Shipping to US addresses is $20 via USPS Priority Mail (2-3 day shipment). International shipping will be extremely expensive because of the length and weight of the shipping box. Please request a quote before ordering. Payment is processed by PayPal but you do not need to have a PayPal account. You can use a credit card. 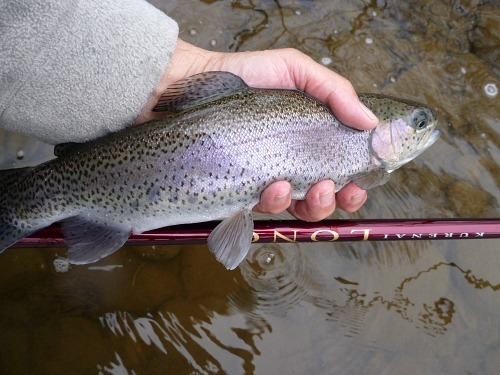 It's my favorite rod as long as I am fishing a big enough stream or river! Chris told me this rod would spoil me. He was absolutely right. First impression: so light for 6 meters. With a rod this long the drifts were out of this world.